Giving variety and life to your mealtime prayers all year long! 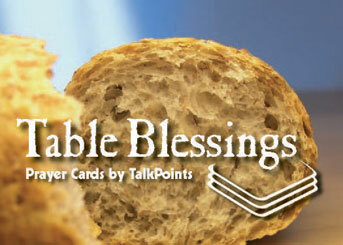 The front of each card is a table blessing to guide your prayer before the meal (year-round). Pick one for each day of the month or shuffle and draw from the deck. The back of the card has an inspiring word from the Bible and table topics. Like food for the body, prayer and conversation are good for the soul. The deck has 32 prayer cards (2 ” x 3 “) and comes in a clear plastic box. We set out 50 boxes to sell to our families at the beginning of Lent and they went like hotcakes!